If you love Pinot Noir, this one is for you! It’s got wonderfully delicate flavors of red cherry and raspberry, very easy tannin and a melt in your mouth finish. MacPhail wines are a collaboration between Tim and Sabrina Persson, 5th generation Hess Family, and well-known Winemaker Matt Courtney. These amazing Pinot Noir grapes are from the Sangiacomo Lakeville Vineyards in the Petaluma Gap region of the Sonoma Coast. 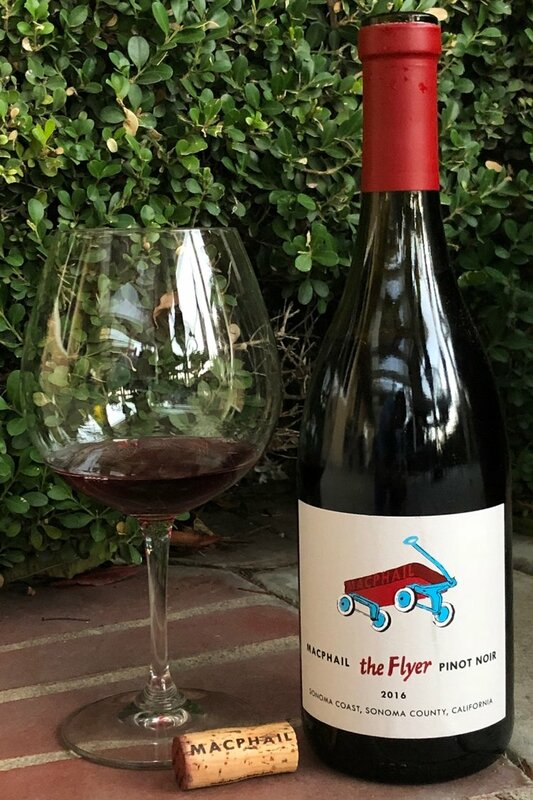 Produced from the 777 and 23 clones of Pinot Noir, these hand-picked grapes are 100% de-stemmed, undergo 100% Native Fermentation and spend 11 months in 100% French oak with 30% of it being new oak. The unfined and unfiltered wine was directly bottled. As Winemaker Matt Courtney says, this wine has “…provocative layers of black fruits - specifically dried cherries and black raspberries that are supported by beautiful acidity and silky tannins. A hint of vanilla oak sweetness shows through a lengthy and persistent finish.” I can’t agree more! As a Sonoma Pinot lover, this one’s tops! The Flyer is not to be missed. It’s super!